It seems likely that later this year, my design practice will be pulling up its skirts and sashaying off to new premises. Thinking about it entirely from a selfish point of view, this will have several ramifications. Firstly, depending on the final location we choose, I may no longer be able to go home for lunch. Such a condition currently inflicts the majority of the working population. Being at home at lunch is luxurious, and I enjoy it very much - and my animals enjoy my presence too. The second ramification of the move will be the opportunity - nay, the necessity - to acquaint myself with a new part of the city, immersing myself in the minutiae of a new location. The pedestrian trails between my house and the new office will also be a chance for discovery. I will have an opportunity to buy coffee each morning in new and better establishments, and explore the back lanes and stray shortcuts that reveal themselves to daily foot commuters. 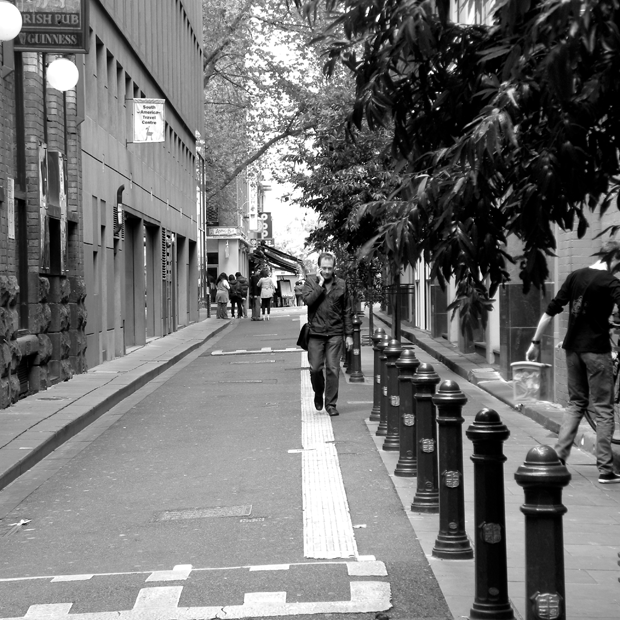 Melbourne city is excellent for such sport, and rewards close examination and random exploration. This potentially is a source of great pleasure, and by extending my commute beyond its current three minutes (literally) all manner of possibilities may emerge. At the very least, I will be 'getting out there' more - a state we are conditioned to believe is wholesome and generally good for us. I am not so sure, but I am willing to take a positive view. One building we are examining for our new premises is a two-storey wedge-shaped commercial building dating back to the early 20th Century, and this is generally more appealing than our current building, which is best described as '1980's boom commercial on a budget'. Whether the light and layout potential of a triangular building is as abundant and practical as our current boring rectangular floor plate remains to be seen. Nevertheless it sounds like a challenge suitable for a team of architects. Controversially, the building in question is off Hoddle's city grid - albeit only by fifty metres or so. Psychologically, relocating our practice off the grid that comprises the Central Business District is a big deal, even if we are only just off the edge. I trust that our egos are robust enough to carry it off, and live without the absolute downtown address, and the cachét that comes with it. On balance, despite the likely impending loss of my lunchtime privileges, I think the move is a positive one, and there may be a daily reward for carrying my camera to work. The chief beneficiary may be my Melbourne Urban Photography Project: my little MUPPet.